On a state visit to New Dehli, US President Obama and Indian Prime Minister Modi have broken a six year stalemate over India’s nuclear liability law which shut out US nuclear firms from the Indian market. The plan results in NPCIL essentially self-insuring through a fund to pay for cost associated with any future accidents. The Hindustan Times reports that India and the United States reached an agreement on Sunday January 25 to break a deadlock that has been stalling the implementation of the civilian nuclear deal between the two countries. Prime Minister Narendra Modi said India is ready to do business with US nuclear firms. 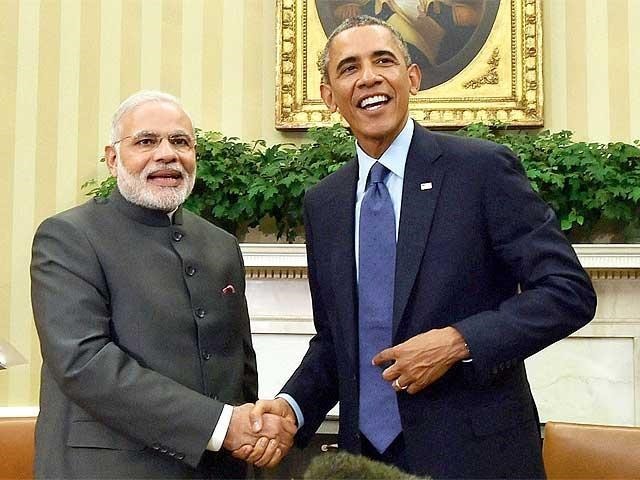 “I am pleased that six years after we signed our bilateral agreement, we are moving towards commercial cooperation, consistent with our laws (and) international legal obligations,” Modi said at a joint news conference with US President Barack Obama. India and the United States signed the civilian nuclear deal in 2008, but strong differences developed over an Indian nuclear liability law that makes equipment suppliers ultimately responsible for an accident. Countries like France and the US have asked India to follow global norms under which the primary liability lies with the operator. “Today we achieved a breakthrough understanding on two issues that were holding up our ability to advance our civil nuclear cooperation and we are committed to moving towards full implementation. This is an important step that shows how we can work together to elevate our relationship.”” said Obama at the news conference. The Hindustan Times report noted that since all the nuclear power plants in the country are run by the government-owned Nuclear Power Corporation of India Ltd (NPCIL), following international norms will mean the government would have to pay the damages in case of an accident. Under the plan prepared by a state-run reinsurer agency, the insurance would be bought by the companies contracted to build the nuclear reactors who would then recoup the cost by charging more for their services. Alternatively, the NPCIL would take out insurance on behalf of these companies. This blog predicted last November that an arrangement like this one, in which NPCIL essentially self-insures, would be the basis for a deal. The deal was concluded following three meetings of the bilateral contact group established last September. The group meet in London most recently to hammer out the agreement announced today. India’s NDTV reports that the US backed off a requirement for tracking nuclear fuel shipments citing IAEA agreements already in place. So how much work will there be for US firms? According to the World Nuclear Association, there is an enormous waiting list of nuclear projects. Of 65 Gwe planned, 21 Gwe are on a short list for near-term construction followed by what is essentially a wish list of another 40 GWe over a longer period of time. Much of the new construction will be 700 MW PHWR reactors of Indian design. The following table, courtesy of WNA, provides the list as of December 2014. Both Westinghouse and GE-Hitachi have projects on the 21 GWe short list. However, due to the liability law, the only thing to show for the effort is a mountain of paperwork. Maybe now there will be real progress? In 2009 GE Hitachi Nuclear Energy signed an ambitious agreement with Indian engineering and construction giant Larsen & Toubro Ltd (L&T) to develop an advanced nuclear power plant in India based on Advanced Boiling Water Reactor (ABWR). L & T would develop the capability to make large castings for reactor pressure vessels and other long lead time procurement items like steam generators and turbines. GE Hitachi Nuclear Energy would provide the technology for ABWR nuclear island equipment and components. L&T’s role will be to engineer, manufacture and construct them . The joint agreement has not been funded, and L&T has bluntly told the Indian government it is its own worst enemy in terms of removing stumbling blocks to executing the deal. Perhaps as much as anything, the choking off of work for Indian firms may have finally tipped the balance for India in terms of finding a work around to the liability law. In response to the announcement in New Dehli today, both Westinghouse and GE-Hitachi voice cautious optimism about the insurance pools. Reuters reported noncommittal statements from both firms that said they are waiting for more details about how the pools would work before committing to projects.